The Droga5 duo analyzed the journey to motherhood by mapping experiential stages, mind-sets, challenges and opportunities over time. In his TED Talk, "The Myth of Average" high-school-dropout-turned-Harvard-professor Todd Rose discusses the Air Force’s approach to designing cockpit seats. By designing for the "average" pilot, the agency thought, the seat would suit most people. Instead, the seat turned out to be inadequate for almost everyone. Millions of dollars later, they discovered that the key to a successful cockpit design lies in the extreme measurements of the shortest, tallest, thinnest, heaviest pilots—the edge users. If you can design a seat that works for them, it will work for everyone in between. There’s no question that advertising agencies are strongly pushing to recruit a wider range of perspectives, viewpoints and backgrounds. We know that diverse teams make better, fresher, more innovative work. The question is, how do we design the agency operating system to best support different types of people: diversity in race, sexual orientation, age, class backgrounds, political views, and more. We thought about the pilot seat as we approached an "edge case" plaguing the advertising industry today—moms. Why do we lose so many talented and seasoned employees to motherhood and not to fatherhood? How could we prevent so many moms from choosing alternative workplaces? And what would an agency look like if it were optimized for moms when they return to work? Would it work better for all of us? While 86% of women in the United States will have children and 70% of mothers with children work, only 39% of women in advertising are moms. Moms make 85% of household purchasing decisions, yet becoming a mother pushes you to the edges of agency life. But do we really understand why? At Droga5, we use human empathy and design thinking to solve all kinds of problems for our clients, so we set ourselves the challenge: why not combine qualitative insights, quantitative data, and customer experience design to systematize the journey to motherhood? Our study included in-depth interviews with new moms across departments and levels. To avoid "survivorship bias", we also interviewed moms who had left Droga5 within the past year. We combined our findings into key insights, a journey map, and a list of recommendations sorted for effort and impact. And more important, we looked for initiatives that improved the service design for everyone at the agency, not just moms. Both process tool and output, the experience map visualizes pain points (in orange) as well as the opportunity space (in blue). While much of our industry’s policies are aimed at encouraging women to come back after maternity leave, we found that the majority of talent drain happens about one year after returning to work. At Droga5, beyond our well-appointed care rooms, robust maternity leave policy and perks like cabs during the last month of pregnancy, we needed to think about our "opportunity space" as a one-year long experience with several interventions along the way. We found pain-points clustered around two themes. Inadequate survival skills to manage and prioritize their workload left some moms with a feeling of "burnout". The other common cohort, "stalled", had a sense that their career priorities were assumed by others. Solutions to combat burnout include the ability to work part-time and a training program to help employees develop assertiveness and self-care skills. Meanwhile, formal stretch assignments and more frequent periodic reviews help ensure careers progress as desired. In a well-meaning attempt to not stigmatize new moms, managers are often reluctant to address the demands of motherhood and treat the return to work as business-as-usual. In many cases, managers felt they didn’t even have the right words to raise the issue with their reports. To help steer the conversation, we provided them with a framework and empathy tool to better understand what a new mom might be going through, and how they can support them through this vulnerable time. 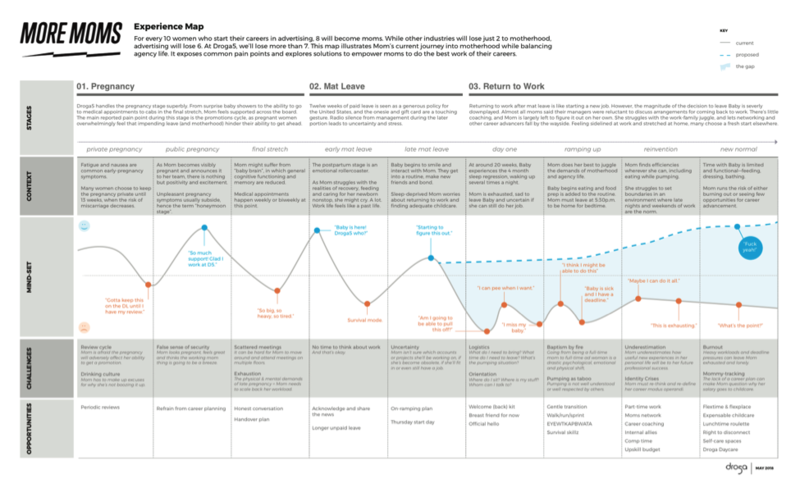 The map (close-up) can also be used as an empathy tool for managers seeking to understand what a new mom might be going through, and how they can support them to do their best work. Finally, a major predictor of work satisfaction was being tapped into a support network. 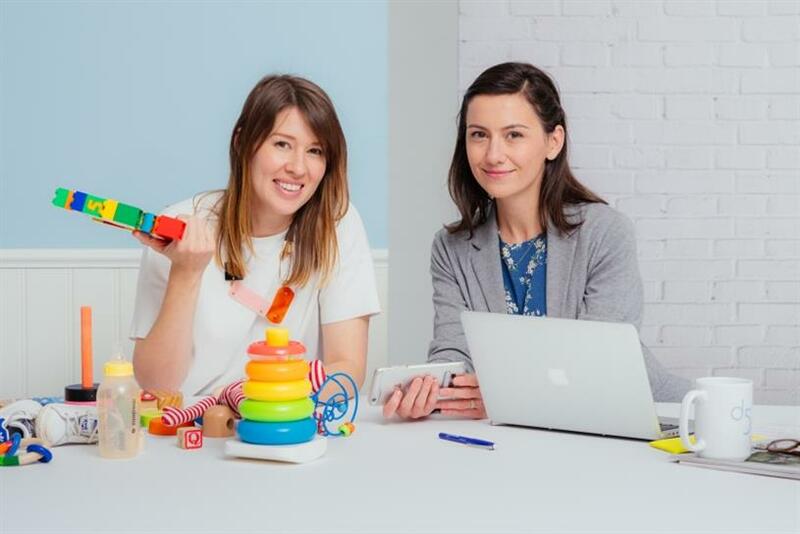 Pairing new and seasoned moms, and setting up a formal communication channel for moms at Droga5 has enabled moms to provide each other with encouragement, comfort, and advice inside the office and out. Ultimately, building an agency to support and respect "difference" is mission critical— diverse perspectives unlock creativity and innovation. Just like pilots, advertising talent comes in different sizes, colors and life stages. While our existing policies were designed with moms in mind, our recommendations have scalability, too. Policies that enable employees to gain maximum flexibility so they can win in all areas of life is not just essential to attract the best talent, it’s also the right thing to do. If you want to know more about #MoreMoms or you’re an agency or client wanting to partner with us on this project, please reach out to: moremoms@droga5.com. Louise Dreier is a content strategy lead and Haley Parker is a strategy director at Droga5.